Sherlock Holmes is quite accustomed to unusual cases and unusual clients, however when 12-year-old Moira Keegan arrives at 221B Baker Street wanting to hire the great detective to save her father's life, both Holmes and Dr. Watson convince the young girl that she must have misunderstood the meaning of a conversation she overheard between her father and mother that made her fear for her father's life. They dismiss her case and send her on her way. However, a few days later they read of the brutal death of Moira's father and at once take up the case. 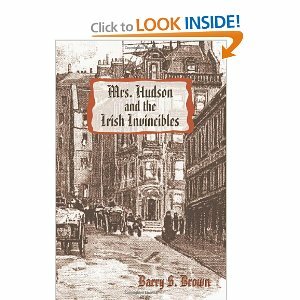 With Mrs. Hudson orchestrating the investigation from the background, they soon find themselves up against some unsavory characters from the Irish Brotherhood, a lack of interest in the killing from the Special Branch at Scotland Yard, a group of religious zealots called the Christian Union, under the leadership of a Reverend Farnsworth, and an overly eager young reporter from the London Times whose motives are not clear. Holmes fans will enjoy this latest puzzle helmed by Mrs. Hudson, as the real brains behind the detective agency housed at 221B Baker Street. Even Wiggins, one of the Baker Street Irregulars, as Holmes calls the street urchins he relies upon to go places and see things under circumstances he cannot, is needed for this twisted case. This unlikely trio, Holmes, Dr. Watson, and Mrs. Hudson would be delightful no matter what case they chose to investigate, yet it's all the more fun when you mix Wiggins and Inspector Lestrade into the case. I've even grown accustomed to Mrs. Hudson's cockney accent. I look forward to more adventures with Sherlock Holmes and Dr. Watson under the guiding hand of Mrs. Hudson. This is the second book in the series. You may read a review of the first book THE UNPLEASANTNESS AT PARKERTON MANOR here.